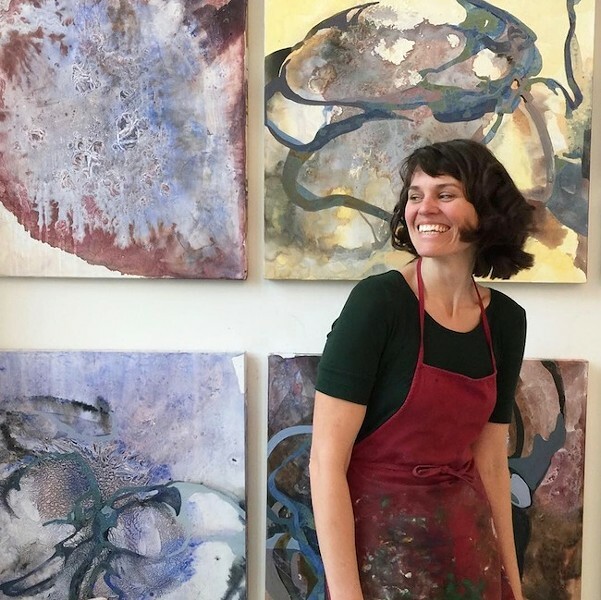 Colorful paintings — collages of fractured shapes and brilliant hues — will line the walls of Central Piedmont Community College's Ross Gallery when Katie St. Clair's exhibit Fruiting Bodies opens on August 15. But the main event arrives five days later in the form of spherical ice sculptures that will be suspended from the ceiling. Sculptures that won't be long for this world. Judging from images of similar spheres St. Clair has created for previous shows, the sculptures are startling. Mushrooms, natural pigments, parts of plants and even roadside trash are encased in the ice, and these verdant and/or decaying materials come unlocked as the spheres slowly melt. During previous installations, people were convinced St. Clair had rigged up tubes so running water would drip through the sculptures and onto the floor. That's an optical illusion, she says. "In reality, the execution is so simple. They're basically big round ice cubes hanging from strings," St. Clair says laughing. The exhibit illustrates a state of flux, the artist continues. Over a period of 24 to 48 hours, the spheres, ranging in size from 8 to 12 inches in diameter, shrink as they drip, splatter and even start to smell. Canvasses stretched below the dwindling sculptures capture water, pigment and pieces of fungi in newly created paintings. As one artwork is destroyed, another one is created. After the first sphere installation on August 20, two more waves of installations will follow on September 12 and October 1. St. Clair says the multiple installations of ice spheres are like adding additional layers of paint to a canvas over time. St. Clair also reveals that the spheres are a result of her hikes in the Carolina woodlands foraging for mushrooms, an activity she picked up shortly after moving to Davidson two years ago. "I wanted to create a body of work that was rooted to the place where I was living," says the 33-year-old assistant professor of art at Davidson College. The exhibit takes its title from the spore-bearing cap and stem, the above-ground part of a fungus we call a mushroom head, as opposed to the root-like often hidden mycelium, St. Clair explains. Fruiting Bodies also represents a culmination of the artist's lifelong fascination with making collages and viewing the world in a fractured way. "As artists, a lot of our fodder for creativity comes from our childhood," St. Clair says, adding that her immersion in nature began when she was growing up in Cincinnati, Ohio. Her mother was a creative writer as well as an avid gardener, and her father is an engineer and farmer who currently lives on a self-sustaining, 200-acre spread in rural Kentucky. After her parents divorced, St. Clair lived with her mother and grandmother in a forested Cincinnati park called Fox Preserve. So a focus on nature is not new to her work, St. Clair says, but it took her a while to come around back to it. While earning a Bachelors of Fine Arts at the Art Academy of Cincinnati, and subsequently a Masters of Fine Arts at the University of Michigan–Stamps School of Art and Design, St. Clair created pieces that exposed people to the act of looking. "A lot of it was figurative work, [images] of women looking in nature," St. Clair remembers. She decided to simplify her approach, eliminating the human figures and focusing on what she calls "the natural world in all its beauty and decay." This approach led to her creating collages, juxtaposing painting with photographs in fractured cut ups that reconfigured time and space. A collage gives images context, St. Clair maintains. "We understand beauty in terms of what is around it," she says. "We see a thing as beautiful because it's surrounded by things that are corrupt." Although she no longer works with photographs, St. Clair feels she has never stopped working with collages' cut-up, fractured and recombined images. "Collage is actually how I think," says St. Clair, who is dyslexic. "The way I think is a little fractured within a normal context, but fracture is not a bad thing." To illustrate her point, she cites her approach to one of her favorite hobbies since moving to North Carolina — foraging for mushrooms. Searching for fungi in the woods involves thinking about space and shape recognition in a decontextualized and reconstituted way, she explains. It's a picture of the world that is less linear than we're inclined to believe. St. Clair says she goes into a meditative space when she starts to comb the woods for mushrooms. "I'll let myself wander and go where I'm led," St Clair reveals. "Once I start finding the right kind of mushroom, my eye becomes trained to that shape and color. It's like something instinctual kicks in — a primal hunter-gatherer sensitivity." She says the same approach holds true for working with collages. When she's cutting up pieces to use in a painting, often the best pieces fall onto the floor. Often, what was once considered refuse became more important than the material she was initially going to use. 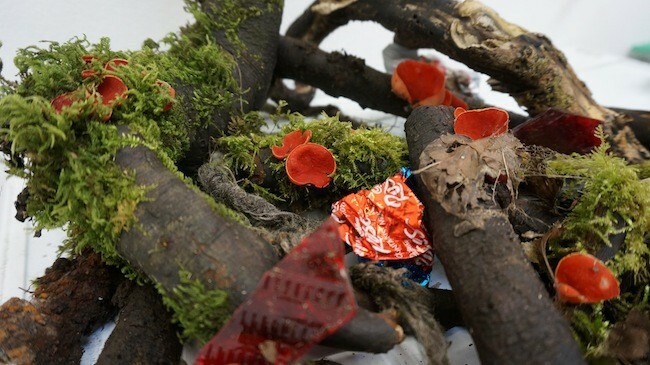 All of which raises a question about St. Clair's choice of raw materials for her art: Why mushrooms? "In a funny way, mushrooms found me," St. Clair says. When she was rambling through the woods she found herself drawn to the shapes, colors and textures of mushrooms. She started making dyes from the fungi to color paper she used for collages and paintings and to add tints to her ice spheres. Finding edible mushrooms and learning to make mushroom tinctures for health benefits turned out to be an unexpected bonus. St. Clair feels focusing on mushrooms for raw material was less a conscious decision and more a case of the mushrooms showing up in her work organically. As an artist she followed where the mushrooms led, and in the process she discovered an intriguing fact about fungi: Mushrooms tend to grow in landscapes that have been disrupted. "If there's an environmental change like an insect killing all the trees — that's the kind of condition that attracts mycelium," the vegetative state of a fungus that forms a mushroom, she explains. Once the mushrooms start to grow, they utilize decaying organic matter and reconstitute into something new. From decomposition comes new life — what we call the fruiting body. "The mushrooms are attracted to the damage we create and they have the cure," she says. "It's an amazing circle of life." St. Clair sees a metaphor for this process in the ice spheres. Once the inert material drops out of the melting sculpture and onto the canvas below, what's left looks like mycelium. There's beauty in decay and renewal, St. Clair maintains. It's a celebration of the ephemeral. A mushroom exists for a limited time, a few days at most. Similarly, the ice spheres only exist for 48 hours, disintegrating as they melt to create paintings underneath. 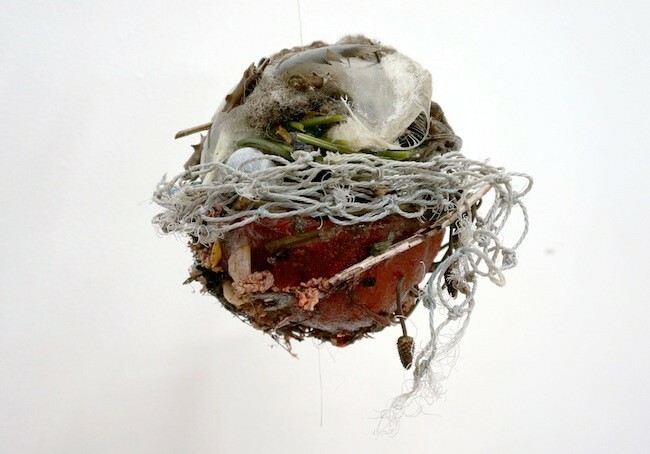 St. Clair collects materials for the spheres from the disruptive marginal landscapes she describes — roadsides and drainage ditches — which ties in with her idea that the natural world is in constant flux. Flux, of course, is very much present in the spheres as they melt, decay and change. "There's a mixture of natural trash and debris in the spheres," she says. "It's whatever I find. I'm not picky. I take what's there." Though the ice sculptures embody an almost cosmic sense of natural cycles, they are created in a homespun setting — St. Clair's kitchen and her freezer. She reveals that she's currently eating all the frozen food in her freezer to make way for art. Using a container similar to a salad bowl, she creates half a sphere. She fills the bowl with trash, natural debris and pigment, fills the bowl with water and pops it in the freezer. "It's just like making ice cubes or a Jell-O mold," she says, laughing. St. Clair pops each frozen hemisphere out of its bowl, drills a hole through each and fits the two halves together to make a whole sphere. An airplane cable connects the icy hemispheres and runs up into the gallery ceiling, while a wooden peg keeps the sphere halves joined at the bottom. Visitors to Ross Gallery who see St. Clair's Fruiting Bodies paintings lining the walls might assume that they are the artwork that forms in an apparently random fashion on the canvasses beneath the sphere. They're not. St. Clair creates those particular paintings in her studio, but the melting spheres inspire her process. Near the end of a previous ice sphere installation, St. Clair looked at the puddles forming underneath the collecting canvases and noticed how the paint was drying. She started questioning if she could mimic that process with paint in her studio. "Weird things would happen when trash mixed in with the other materials," she remembers. "When something that has gasoline on it mixes with the pigment and water, it creates a chemical reaction." The canvases on the gallery walls will be St. Clair's attempt to recreate that chemical reaction under controlled conditions. "I started using paint in very different ways than I ever would before," she says, "and it's all because of the inspiration of the spheres." 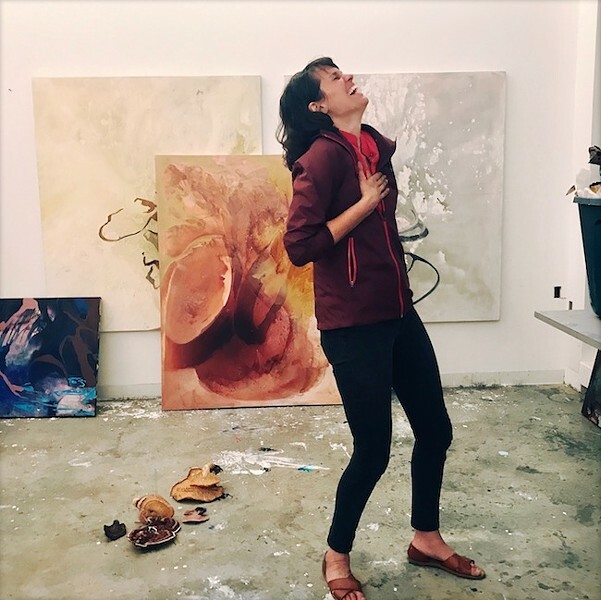 When St. Clair first developed the idea to create the melting spheres, it stemmed from a desire to create a metaphor for what happens daily in her studio. When she is working she is frequently covered in paint from head to toe, with paint dripping down and drying on her arms. It's not a far cry from melting balls of ice to create puddles of paint, fractured mushrooms and piles of roadside debris. For St. Clair, the act of creation is just like life —immersive, tactile and frequently messy. She takes a similar approach to the art classes she teaches at Davidson. She teaches in a tactile, hands-on manner, encouraging her students that it's okay to try anything, because it eliminates the fear of failure. "I promote the idea that anyone can have an amazing creative practice in his or her life," she says. For St. Clair, creative practice means that art is something that you show up for every day. It's not about making one good painting to get a grade. Rather, she teaches learning habits and urges experimentation. She's less concerned with pushing final product, and more interested in encouraging students to push past their own preconceived notions of what is right and wrong, and what is good and bad. Given St. Clair's organic teaching methods and her devotion to nature it comes as no surprise that she advocates for sustainable living. She's traveled to Indonesia to study cultural views surrounding life cycles: refuse degrading on streets, the burning of native landscapes and local death rituals. She went diving in the Indian Ocean to photograph and document the dying coral reefs. She's a committed environmentalist, but she's not evangelical about it. "I don't think it's my job to use art as a petition," she says. "I have a positive outlook on the impact people can have on the world. I believe that people are good at their core." Art can inspire and build awareness of how the choices we make can change the world and make life better, she believes. Art can open a window, she continues. "I think art can make us stop, look and actually question things," she concludes, and she hopes the ice spheres are part of that process. 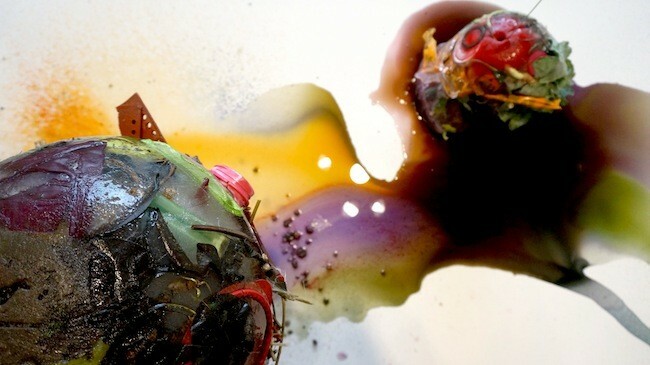 Maybe melting globes of ice, pigment, mushrooms and roadside trash can lead viewers to contemplate the cycle of life and decay on this fragile planet.